When Mike and I visited my parents in Virginia this Easter, my mother was struggling to come up with the perfect dessert to serve after our long holiday meal. She wasn't struggling in the sense that she is not a good baker (she is) or that she did not have a plethora of recipes to try (she does), but I imagine quite like myself, sometimes the endless availability of beautiful desserts in every magazine and Pinterest can overwhelm one's excitement to actually create something new. As I sipped my milky coffee and kept an eye on the pasture outside for the cows to begin grazing for the day, I thought through some of my favorite recipes from her file. Something simple, something she could whip up quickly without too much fuss so we would still have time to catch-up over after a few afternoon glasses of wine. This cake fit the requirements perfectly. Incredibly easy to create, but don't be fooled - the crumb is unbelievably moist, while the apricot juice adds an extra later of flavor while expertly balancing the sweetness. All that and it is one of the most beautiful cakes to grace the top of a cake stand. Get your forks ready. Preheat oven to 325 degrees. Evenly coat an angel food cake pan or bunt pan with nonstick spray. In a stand mixer fitted with the paddle attachment, combine all ingredients and beat a medium speed for 3 minutes. Pour the batter into the prepared pan and lightly tap against the counter a few times to release any air bubbles. Bake until golden and the cake just begins to pull away from the sides of the pan. Allow to cool in pan; when it is cool enough to handle with your hands, release the cake from the pan and invert onto a cake stand. While the cake is still slightly warm, combine the confectioner’s sugar and lemon juice in a small bowl. 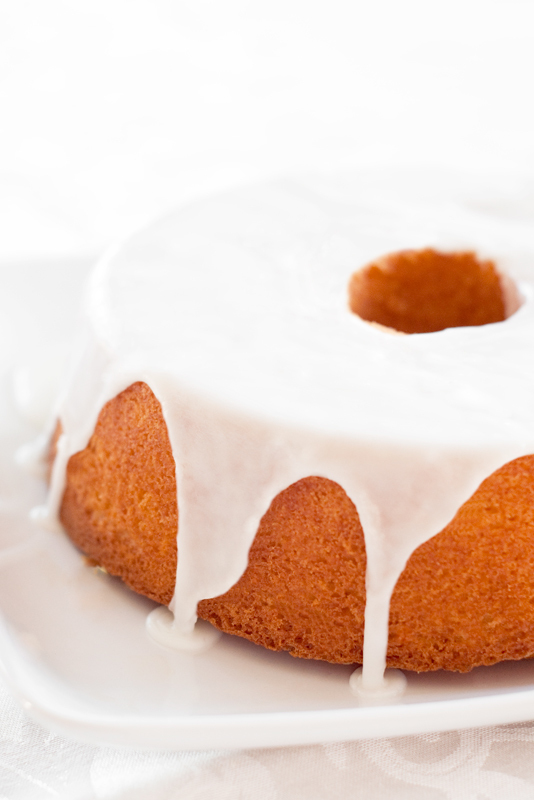 You should add just enough lemon juice to make a glaze – it should not be too runny. Whisk to remove any lumps from the glaze, then spoon over the cake.